RFA Board of Directors 2018-19. Front row left to right: Donna McGrath, Operations Chair Jackie Burke, President Jamie Tucker, Vice President Bev Upshur, Micki Pugh, and Communications Chair Lucy Schneider. 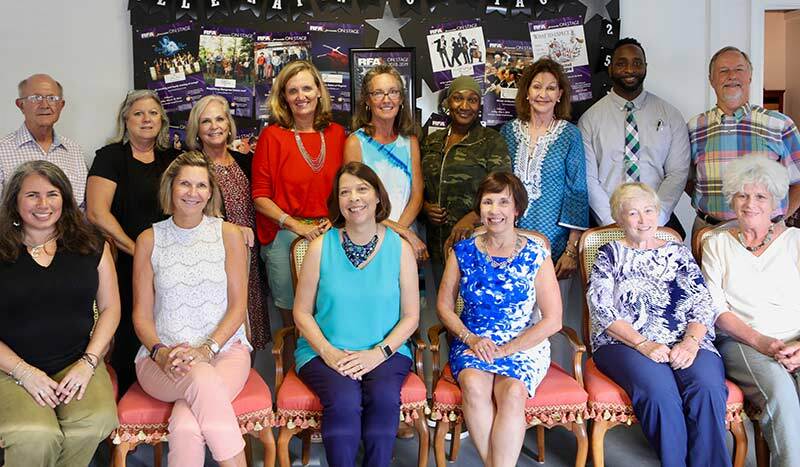 Back row: Mike Kennedy, Barbara Breeden, On Stage Chair Kara Johnson, Lisa Shivers, Outreach Chair Linda Norman, Elsie Delva-Smith, Peggy Stalnaker, Bryant Hudgins, and Lee Pulling. Missing from the photo are John Mecke and Cyndie Stephenson. Founded in 1986 as a non-profit 501(c)(3) organization, the Rappahannock Foundation for the Arts promotes the arts in the lower Northern Neck of Virginia. The organization is governed by a Board of Directors made up of community volunteers. Directors and members of various committees are responsible for strategic planning, management, programming, fundraising, and publicity. Volunteers for these committees are always welcome; individuals interested in contributing their time and talents to RFA should contact the RFA office at (804) 438-5555.